Even with great couponing skills, we all reach a point where we need a little extra cash. Between back to school shopping, and stocking up on holiday decor, who wouldn’t want more spending money? But what happens when you don’t have enough time for a part time job and aren’t quite ready to part with that extra kidney? 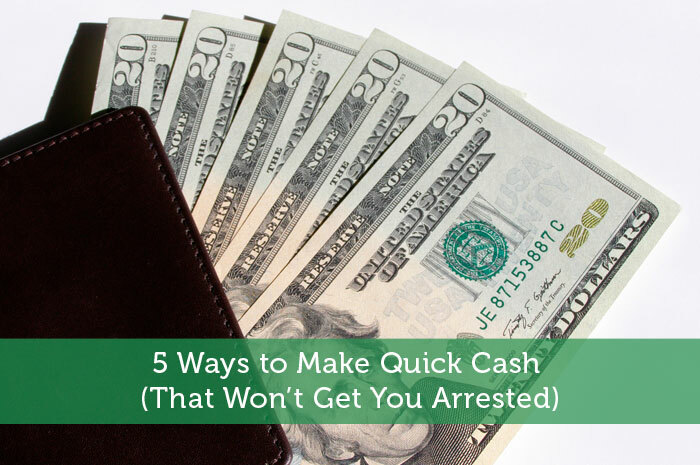 Thankfully, there are other quick and easy ways to earn extra cash. Recycling things like aluminium cans and scrap metal not only helps the environment but can end up having a nice little payoff. It might take a bit longer to gather up those reusable items, so try asking for help if you know someone that works in an office or school where people might drink things like soda. You’d be surprised how fast that stuff adds up. Have a special talent? Next time you reach for the craft box, consider making something that others might like. Selling items at a street fair or on an online DIY store, like Etsy, is an easy way to make cash for those not-so-often expenses. Maybe you won’t be the only one who loves your homemade trail mix and painted mugs. Ever heard of Pampered Chef? It’s a catalogue company that sells cooking products and online recipes by using consultants to get the word out about products. Think of it like managing a boutique straight from the comfort of home. There are a ton of other providers you can choose from like Scentsy, Younique and Thirty-One. With a starting investment and the right personality, you can set yourself up for another source of income. Not only do you get special perks, like free products, but it’s a great way to meet people! Ever think that babysitting would be a fun job when you got older, but never did it? Or did you do it for a while and miss it? Either way, it’s never too late to revisit the idea. Online profiles can match you with families in your area who are looking for everything from one time dog or house sitters to full time nanny positions. A lot of users enjoy hiring caretakers who have families of their own for that added sense of security. Extra perks include not having to put up those old school flyers yourself! Try selling back clothes you’ve outgrown, or don’t wear anymore, to thrift shops. You’ll get an even bigger payoff if the tags are still attached. If you prefer donating, Goodwill offers tax deductions for your unwanted apparel. For the extras, like movies and albums, add the Decluttr App to your handy list of lifesavers. You can scan the DVD, Blu-ray, video game, or CD barcode right from your smart phone, and they’ll let you know how much they will pay for it. It’s a must have, even when you’re not strapped for cash. So, part time jobs and the black market aren’t the only ways to make more money. Throw in some benefits like working from home or keeping the earth clean, and you’ll want to partake in these extracurricular activities more than once. Paid surveys – this is basically one of the worst ways to make money ever, but I can’t deny that it technically DOES work. You have to fill out about a zillion surveys to even get a check, but if you’re really dedicated you can get money out of it. And I suppose if you’re just filling them out while you’re watching television, it’s really not so bad. Not having enough money can really be a drag on a person’s life. I’ve had to become a business dealer in the past in order to pay the bills. I was selling cutlery via referrals. I’m glad that it was able to help me pay my bills in those days. I hadn’t considered selling back old junk. It makes a great idea though. We have a local used clothes store that buys nice clothes back from people. I’ll have to hit them up and find out what I can do. Thanks again!